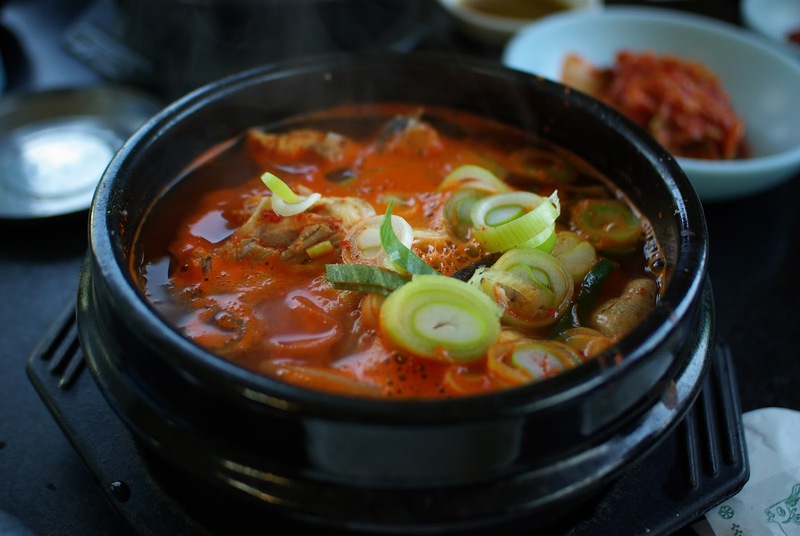 Haejangguk is a hearty guk that includes an assortment of ingredients to create a rich flavor that immediately wakes the senses as the warmth of the first sip hits straight into the gut. The soup refreshingly reminds the hangover victim of the haejangguk testimony and secretly adds a reason for another night of rambunctious drinking just for the sake of downing another bowl of haejangguk! This guk dates back to one of the longest and oldest Korean Dynasty of Joseon and was traditionally served to relieve a hangover. Primarily eaten by commoners of the time, men headed straight to Haejangguk Houses in the morning to relieve the wrath of a hangover after a night of heavy drinking. In times when work consisted of toiling in the fields, men could not call in sick for work, so they turned to haejangguk to aid them with a good start. The tradition of eating Haejangguk as a hangover cure is still carried out, but men do not have to seek Haejangguk Houses as they did back in the days. Today, this dish is available at most restaurants. The appearance is bold. Stock full of vegetables and meat, one does not know where to dip the spoon first. The taste is appetizing and savory. However, the flavor of the Haejangguks that include fermented soybean paste or cow’s blood can be distinctive. It is definitely an acquired taste. The most popular and traditional Haejangguk is made from ox bones boiled and made into stock. Occasionally, soybean paste covered meat or pig intestines are added along with clotted cow’s blood with various seasoning. Then it is topped with a variety of vegetables such as cabbage leaves, leeks, green onions and kongnamul (bean sprouts) that are commonly used in Korean dishes. It is boiled in a kettle until piping hot and usually served in traditional earthenware. The variation of Haejangguk changes depending on the regions of Korea, but each adaptation is known to get the job done. So the next time a hangover pays you a hard visit and you want to try an exotic hangover cure, try some good old fashioned Korean Haejangguk!